If you're looking for a nice, cool way to top off a meal or kill some time before meeting up with friends at Daejeon Cantina or Yellow Taxi﻿, why not situate yourself across from the TimeWorld LeeChard Pro Hair that looks like a tooth (you know the building) and enter the wonderful land that is SnowSpoon? 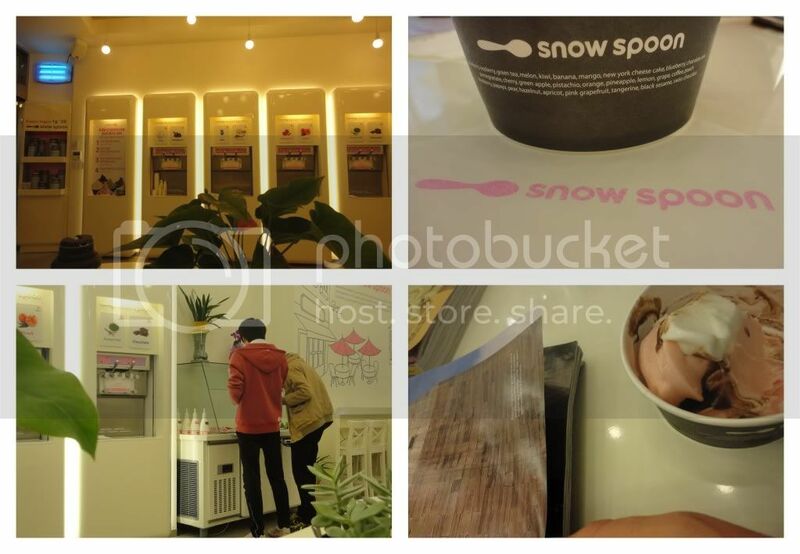 Recently introduced to Dunsan-dong, SnowSpoon is a frozen yogurt shop where customers pay for the exact weight of their creation - including any variety/combination of yogurt they may choose (currently: coconut, chocolate, plain, green tea, blackberry, peach, strawberry, and 'blue') plus toppings (including: cereal, Oreos, chocolate syrup, caramel syrup, fruits, white chocolate, chocolate chips, sprinkles, etc.). The more you pile on, the more you pay. If you're nervous that your eyes for sweets may exceed the cash in your wallet you can always opt for one of their amazingly delightful Ice Cream Sandwiches (Mango-Yogurt, Chocolate Chip Cookie and Dark Chocolate Yogurt, Oreo Cookie, Strawberry, etc.) which run about 3,500 Won. Most definitely worth a stop if you find yourself hitting up the nightlife or otherwise in the TimeWorld neighborhood!